If you’ve ever seen a forklift, you’ve surely noticed the two metal prongs at the front end of the lift. These are called forklift forks. They may not look like the forks we eat with. But they serve the same purpose – lifting and moving loads of different sizes from point A to point B. In a warehouse, forklifts are used to lift and move the heavy stuff as well as the light. The same goes for construction sites and dockyards. No matter the location or the weight of the load, forklifts couldn’t do it without their forklift forks. HOW DO FORKLIFT FORKS GET DAMAGED? Forklift forks can get damaged in a number of ways. For starters, the heel of a forklift fork – the part that curves upward and outward – can become thin over time. This is due to daily operations. In addition, some forklift attachments can also lead to damage if the forklift forks are pushed past their limit on a daily basis. HOW CAN FORKLIFT FORK DAMAGE BE PREVENTED? Preventing damage starts with proper maintenance. Companies should refer to the manufacturer’s guidelines for when and how to maintain the forklift forks. Then they should follow a schedule of regular and timely maintenance. Companies should also inspect the forklift forks at least once a year – more often with heavy use. Workers can prevent forklift fork damage by using the following techniques. These are common sense forklift best practices. But it never hurts to remind workers of their importance. – Protect the heel. The weight of a load is carried on the heel of a forklift Taking good care of the heels will help keep the entire forklift in good shape. – Use the forklift forks for lifting only. Again, this is common sense. But forklift operators will often use the forklift forks to push objects around or pry things open. This is especially true if they are under pressure to finish a job. Either way, incorrect use of the forklift forks can damage them and compromise the safety of the forklift. – Do not exceed the forklift maximum capacity. Even the strongest forklifts can only hold so much weight. The maximum weight limit is the amount the truck can safely hold, and should never be exceeded. Doing so can damage the forklift forks and other parts of the forklift. – Ease the forklift forks down to the ground. Forklift forks are designed to be lowered at a smooth, moderate rate. Letting loads down too fast or too forcefully can cause cracks in the forklift Bringing a load down too fast can also cause damage to the floor. – Always use both forklifts Using only one – even for light loads – can put too much pressure on it. This can easily result in bending or cracking. WHEN SHOULDN’T FORKS BE USED? Any of these conditions can make the forklift unsafe to use. 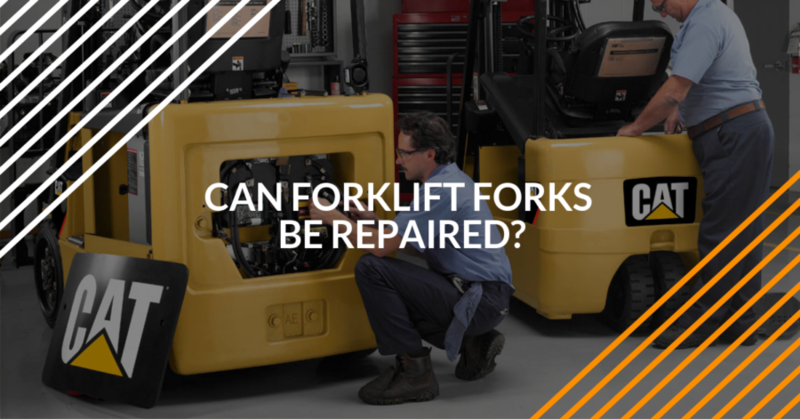 So don’t delay when it comes to repairing or replacing defective forklift forks. WHAT ARE THE RULES FOR FORK REPAIR? When forklift fork repairs need to be done, the first step is to get approval from the manufacturer. This isn’t done just as a courtesy to the manufacturer. It’s done because OSHA requires it. According to OSHA, “Modifications and additions which affect capacity and safe operation shall not be performed by the customer or user without the manufacturer’s prior written approval.” This includes forklift fork repairs. Also, you are not allowed to use replacement forklift parts that are different from the original parts. All new parts must be provided and all repairs approved by the manufacturer before you can begin. OSHA guideline is designed to prevent accidents through improper repairs or the use of incorrect parts. ARE THERE INSTANCES WHERE FORKLIFT FORKS CAN’T BE REPAIRED? In all these situations, you will need to replace the forklift forks with new products. HOW CAN WORKERS STAY SAFE FROM FORKLIFT FORK-RELATED HAZARDS? The number one way workers can stay safe and avoid forklift fork damage is through operator training. Forklift training teaches workers how to safely operate forklifts. It teaches how to perform equipment inspections. It also helps workers know when forklift forks are damaged and need to repaired or replaced. Workers also learn how to recognize hazards to avoid damages and accidents in the first place. Keep your workers safe and your forklift forks in good condition. Check out the online forklift training from ForkliftCertification.com today to learn more!